In some modern Pagan traditions, including some forms of NeoWicca, the eight sabbats or holidays are divided into two groups: the Fire Festivals, or cross quarter days, and the Quarter festivals. The Fire Festivals, or cross quarter days, include Imbolc, Beltane, Lammas/Lughnasadh, and Samhain. The Quarter festivals, or lesser sabbats, include the solstices and equinoxes. The term “quarter days” is derived from a system in the British Isles in which certain days, falling four times a year, and near the solstices and equinox dates, were marked as a time to collect rents, hire new servants, and resolve legal matters. In England and Wales, the original quarter days were Lady Day, Midsummer, Michaelmas, and Christmas. These, obviously, correspond with Ostara, Litha, Mabon and Yule. This system of quarters was used as early as the Middle Ages. Interestingly, in pre-Christian Ireland and Scotland, “quarter days” were based on the early Celtic calendar, and so rents were collected and accounts paid on the days we now consider the fire festivals, or cross-quarter days. Ostara: Ostara is the time of the vernal equinox, and falls around March 22 if you live in the Northern Hemisphere (around Sept 22 for Southern Hemisphere readers), and it's a true marker that Spring has come. Ostara corresponds with the old Lady Day celebration found in the British Isles. Litha: Litha is the celebration of the midsummer solstice, and falls around June 21 in the Northern Hemisphere, and December 21 below the Equator. It marks the longest day of the year, and the point at which the nights begin getting longer once more. Mabon: This fall festival celebrates the autumn equinox, and takes place around September 21 in the Northern Hemisphere, and March 21 in the Southern Hemisphere. It is often marked as the second of the harvest celebrations, and corresponds to Michaelmas on the old English calendar. Yule: Falling around December 22 above the equator and around June 22 in the Southern Hemisphere, Yule marks the longest night of the year. A direct contrast to Litha, this is the Sabbat at which the days begin to grow longer again. The cross quarter days of Imbolc, Lammas, Samhain and Beltane are often associated with the element of fire. 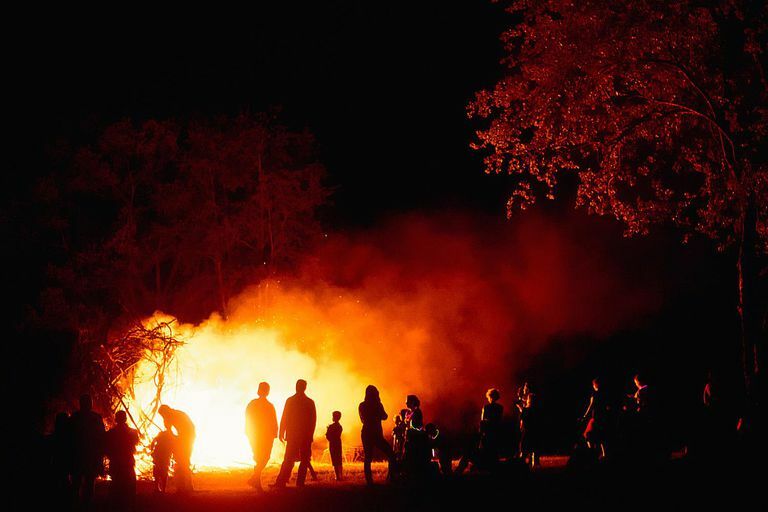 Beltane in particular is known as a festival of fire, and it’s not uncommon to celebrate the greening of the earth with a large bonfire. Imbolc: This celebration takes place around February 2 in the Northern Hemisphere(August 2 in the Southern Hemisphere), and corresponds with St. Brighid's Day or Candlemas. For many Pagans it's a celebration of candles and light and fire. Beltane: Beltane is a celebration of the greening of the earth, and is often celebrated with a big bonfire. It takes place on May Day - May 1 - if you live above the equator, and October 31 or November 1 if you live in the Southern Hemisphere. Lammas/Lughnasadh: This is the first of the harvest festivals and celebrates the reaping of the grain. In some traditions, it is Lughnasadh, and honors the Celtic blacksmith god Lugh. It takes place around August 1 in the Northern Hemisphere, and February 1 below the equator. Samhain: Samhain is known as the witches' new year, and is a time when the veil between this world and the next is thin. It's a good time to do some fire scrying! Celebrate Samhain on October 31 in the Northern Hemisphere, and May 1 in the Southern Hemisphere. Some traditions of Wicca and NeoPaganism celebrate only the quarter days, while others observe only the cross-quarter festivals. Choose which ones you're going to observe based on the guidelines and needs of your tradition.